The Marin History Museum offers visitors a tremendous glimpse into the county's venerable past with an expansive collection of artifacts and ephemera, with everything from sepia-toned vintage postcards advertising the rail line of Muir Woods' glory days to galvanized tin milk buckets from the bygone dairy farms of San Anselmo, and exhibits on such notable natives as arctic explorer Louise Boyd, New Deal photographer Dorothea Lange, notorious lumber baron Robert Dollar and many more. Soon to be added to this august list of Mariners: James, Kirk, Robert and Lars. Or, more simply, Metallica. The thrash-metal, multiplatinum, group-therapy-seeking, Napster-busting, leather-pants-wearing soon-to-be Rock and Roll Hall of Famers and lords of rock will be performing in September as part of a fundraiser for the Marin History Museum's upcoming exhibit "Marin Rocks." The exhibit will celebrate the county's rich tradition of hosting such music icons as the Grateful Dead, Janis Joplin, Big Brother, Jefferson Airplane and, yes, those bad-boy shredders themselves. Why are these heavy-metal, some-kind-of-monster men playing a benefit show for a county history museum? Well, besides being hard-as-nails-aggressive-thrash mavens, they're also dads. According to museum chief curator Dawn Laurant, band members and Marin residents Lars Ulrich and James Hetfield are actively engaged local citizens. "They are very rooted in the community and into raising children here," she says. "They liked the idea of combining history with workshops and classes to connect generations and keep the Marin community alive." In developing this exhibit, the museum developed ties with many musicians, but Metallica was the first to clear a spot on their world tour for the benefit concert. The band has its own rich history in Marin. They recorded their 1997 Reload at the Plant Studio in Sausalito and have their own "HQ" recording studio in San Rafael. Since the announcement of the upcoming show went up on Metallica's website, the museum has popped onto the radar of thousands of metal-heads worldwide, even receiving enthusiastic phone calls from Germany. 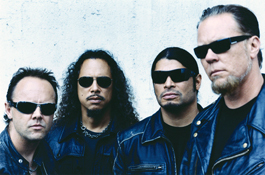 "We just want to say how thrilled we are that Metallica is giving us this benefit. We couldn't do this without the support of local musicians," Laurant says. A bit of head-banger herself, she rather uncontrollably adds, "Yay! I can't wait for the concert!" Hold onto your sepia-toned vintage postcards, it's going to be wild when tickets go on sale Aug. 1; they are going to go faster than Lars can decimate his 15-piece kit. The masters of metal will turn the amps up to 11 on Sept. 11 at the Marin Center's Veterans Memorial Auditorium. 10 Avenue of the Flags, San Rafael. Ticket prices start at $100. 415.499.6800.